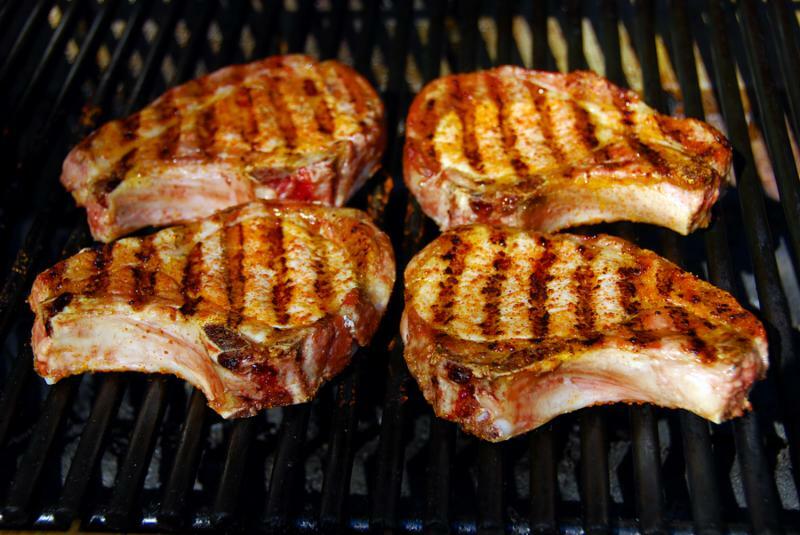 Easy to grill, these delicious chops soak in a mustard brine for only 2 hours. Perfect for a casual cookout or 4th of July summer celebration. Heat the vinegar to a simmer then add the salt and sugar. Stir until the salt and sugar are completely dissolved. Pour in a large bowl and add the peppercorns and mustard powder, stirring to combine. Cool the mixture slightly for 10 minutes then add the ice cubes and stir to melt most of the ice. Pour into a large doubled plastic bag, plastic, or glass container. Add the chops making sure they are completely covered with brine. Refrigerate for a minimum of 2 hours turning the chops halfway through the brining period. Heat a grill to smoking hot, grill the chops for 4-5 minutes per side or until they reach 145 degrees. Rest 10 minutes loosely covered with foil before serving.